if you grew up with them? The film went on to steal the top grossing film of the year slot, with $380MM in box office receipts. 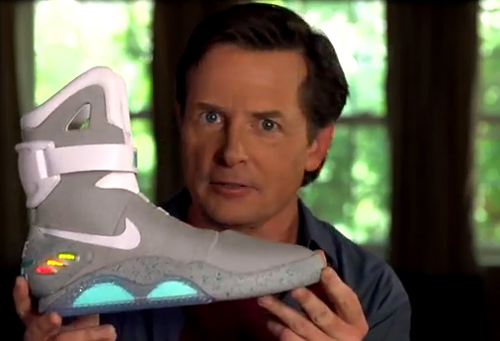 Back to the Future (followed by Back to the Future II) became a classic, with awards and honors too numerous to count. We all grew to love Michael J. Fox, the actor cast as an iconic 1985 teenager who was transported back to 1955 when his parents were in high school. We got to know him better as Alex P. Keaton in the TV series, Family Ties, and later as Mike Flaherty in Spin City. His boyish charm wiggled his way into all of our hearts. But, perhaps the most critically acclaimed role of Michael's life occurred in 1991, when he was diagnosed with Parkinson's disease, a degenerative disorder of the central nervous system. As his symptoms worsened, he chose to go public with his illness in 1998 and later to begin the Michael J. Fox Foundation in 2010 to help raise both awareness and money to fund research on Parkinson's Disease. Now, Nike has joined forces with Michael and his foundation to help raise those all-important dollars. 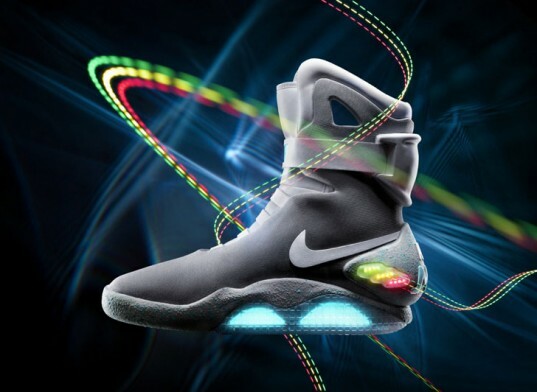 Nike designer, Tinker Hatfield, and footwear innovator, Tiffany Beers, have recreated 1,500 pairs of Nike Air Mags shoes ... the futuristic shoes that Marty McFly wore in Back to the Future II, when Marty was transported forward in time to the year 2015. 150 pairs of Nike Mag shoes are being auctioned off on eBay each day for 10 days, until September 18 when the bidding ends. Current prices are in the range of $2,500 for each pair of shoes being auctioned. We can all hope that at some point in our lives, we can look "back to the future" and find no remnants of Parkinson's Disease. Can Your Life Be Significant Without Ottawa?